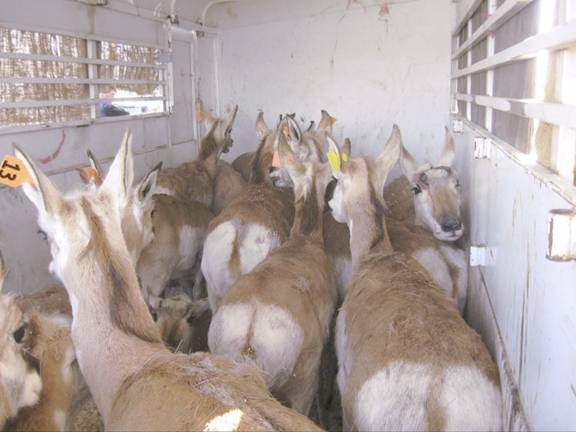 In January of 2011 ninety-nine pronghorn antelope were released on to the Yakama Reservation. 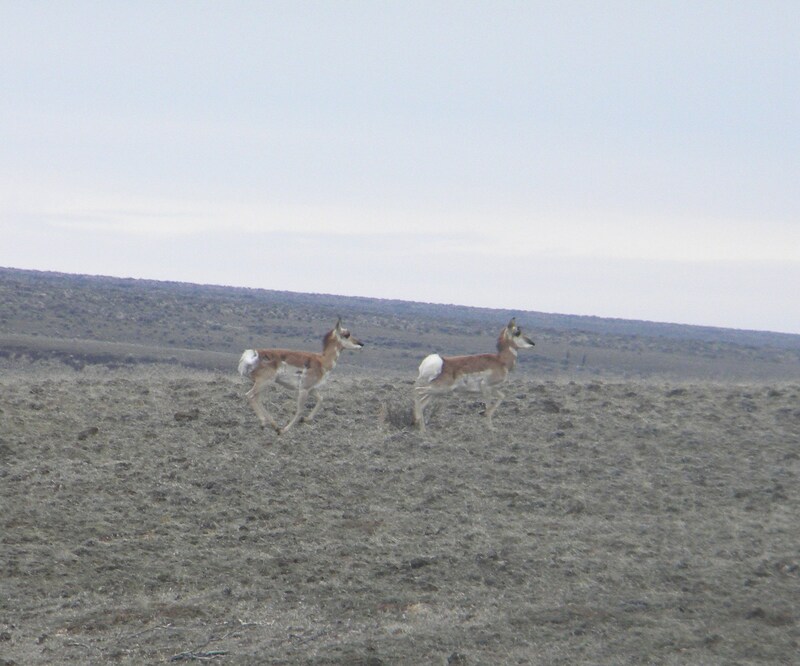 These are the first pronghorns to occupy reservation rangelands in over 100 years. After six years of work the efforts of the Yakama Nation Wildlife, Vegetation and Range Program and the Central Washington Chapter of Safari Club International finally came to fruition. The first step in this long process began in 2005 with pronghorn habitat analysis for the rangelands of the Yakama Reservation. This analysis, funded by the US Fish and Wildlife Service, indicated that there was suitable habitat throughout the shrub-steppe portion of the reservation, with the best habitat in the eastern portion of the East Satus area (Simmons-Rigdon, et al., 2005). Funding for this project was provided by Shikar Safari Club and the Central Washington Chapter of Safari Club International. Safari Club members, the Nevada Department of Wildlife and numerous volunteers assisted in the capture and transport to the release site. 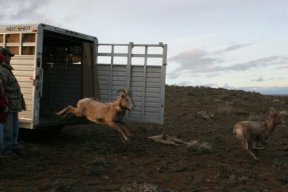 Thirteen California bighorn sheep (Ovis canadensis californiana) were released in historic range in the Dry Creek and Logy Creek areas of the Reservation in February of 2005. 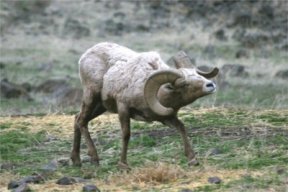 An additional 10 bighorns were released in October of 2005 for a total release of 23 sheep. 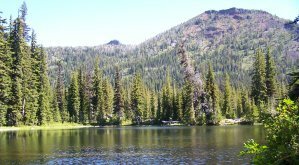 The first group of sheep came from Cleman�s Mountain northwest of Yakima and the second group came from private property in the Yakima Canyon. Three of the sheep were rams and twenty were ewes. Eight lambs were born in April and May to the first 13 ewes that were released. In January 2007, three additional sheep were released. January of 2008 saw the release of 22 more for a grand total of 48 released on the reservation since 2005. The WDFW assisted the tribe in capture of the bighorns, personnel from the USFS and BLM also assisted in the capture of bighorns on Cleman�s Mountain. Funds for this project were provided through a grant from the US Fish and Wildlife Service (Tribal Wildlife Grant). Twenty-two animals were fitted with radio collars and are monitored on a monthly basis. As the population grows, surplus animals will be harvested on a permit basis providing a long missing component of Yakama culture and tradition. Picture 2 - Showing display. 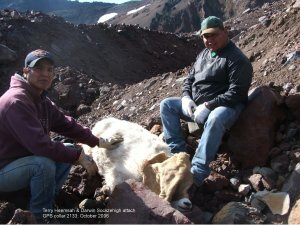 In 2006, our first drawing took place and four permits were issued to Yakama Nation Tribal Members to hunt Bighorn Sheep rams in the Ceded Area. Permits will again be available this year with a drawing to be held on August 1st, 2010. 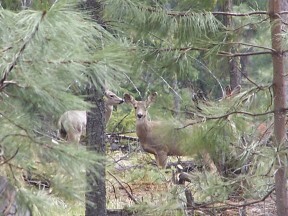 In 2010, the first permit was issued to a tribal memebr to hunt a bighorn sheep on the closed area of the reservation. 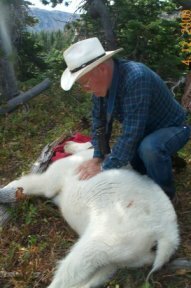 The lucky hunter was John Washines, who harvested his ram on October 27th, 2010. Picture left - John Washines with his 2010 bighorn sheep ram harvested on the Yakama reservation. Picture right - Jim Stephenson measures and marks the first reservation bighorn sheep. 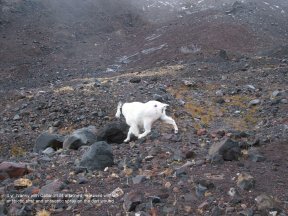 In the fall of 2004 four mountain goats (Oreomnos americanus) were captured on Mt. Adams and radio collared with conventional VHF radio collars. Two of these animals were darted from the ground and two were darted from a helicopter. Five+ goats were also color marked with paintball guns. The objectives in this study were to determine goat movements between the Mt. Adams population and the Klickitat River Canyon population, to determine seasonal habitat use and to determine productivity and mortality. Funding for this research was provided through a grant from the Tribal Wildlife Grant (USFWS). In 2005 Laurel James, Yakama tribal member and employee of the Wildlife Program, became the first Native American recipient of the Wildlife Conservation Society Research Fellowship awarded in North America. 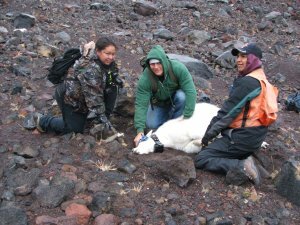 This grant will greatly augment the current research on the Yakama Reservation Mountain Goat populations by providing an enormous amount of data over a short period of time. Four GPS collars and a receiver were ordered from Vectronic Aerospace GmbH and attached to goats within the Mt. Adams sub-population area. One goat was darted on the ground and 3 goats were darted from a helicopter in the fall of 2006. Location and activity data were collected several times a day and stored on the collar for each animal and downloaded to the receiver during the telemetry flight. The information gained from these collars further assists the tribe in determining the full extent and range of seasonal habitat. Picture - Laurel James, Michael Porter, Terry Heemsah, and Darwin Sockzehigh collar a goat. Picture - Jim Stephenson monitors a sleeping goat, and finally it is released! Pronghorn antelope (Antilocapra americana) were historically present on the Reservation. A comprehensive analysis of habitat for this species was conducted in the area of East Satus during 2004. Approximately 40,000 acres of fair to good habitat was identified in this 150,000 acre area. This project was also funded by a Tribal Wildlife Grant (USFWS). Further habitat analysis for pronghorns is planned for the West Satus area in 2007. 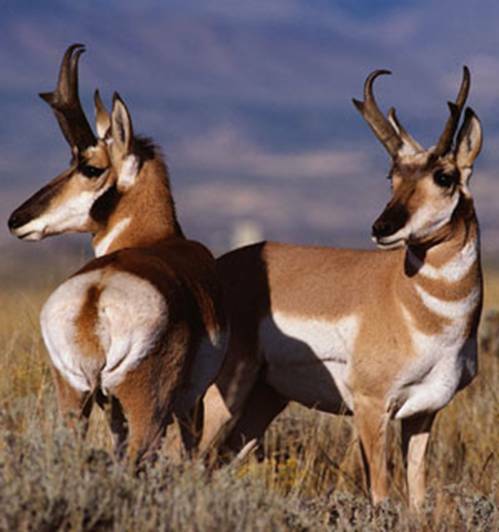 A reintroduction of pronghorns is currently under consideration for 2011. 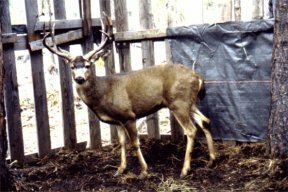 From 2002 to 2008, a study of mule deer (Odocoileus hemionus)was undertaken on the 85,000 acre Toppenish Creek Game Reserve. This study is a continuation of the Klickitat Deer Study Project funded by the Bureau of Indian Affairs. Since 2002 seventy-five deer were captured from this herd. Forty-three of these animals were radio-collared and ear-tagged and another 32 were ear-tagged only. Many of these deer migrate to higher elevations during the summer, but a considerable number remain within the confines of the Game Reserve throughout the year. Many deer migrate across the Klickitat River to the foothills of Mount Adams and the Goat Rocks and one deer migrated off Reservation to an area near Walupt Lake. Of the ten documented deer mortalities only one was shot by a hunter. Many of the others were old age class animals and presumably died from natural causes during the winter months. These preliminary results indicate that there is likely a considerable number of deer that reside within the boundaries of the Game Reserve their whole lives and end up dying of old age. Picture 2 - Deer in hiding. 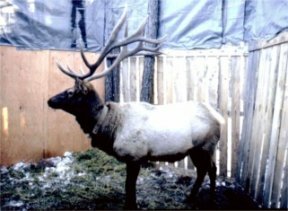 From 1992 through 1999, Dr. Scott McCorquodale conducted research on the Yakama Reservation elk herd on habitat ecology and harvest vulnerability of elk. A total of 81 elk were radio collared during this study. Habitat use was determined to differ between males and females, but adult and sub-adult males selected habitat in a similar manner. Males preferred mature, semi-closed forest and females selected more open terrain. Most elk mortality was caused by hunting and most elk were taken from late August to late October while they were still on summer and fall ranges. Dr. McCorquodale is currently employed as the deer and elk specialist for the Washington Department of Fish and Wildlife.